It has occurred to me recently that I don’t talk about books enough on this blog. Considering that books were among my first loves, this oversight just won’t do. Of course, all types of stories are important, and I’ve talked about good old Harry Potter more than once. But there’s more than just Harry Potter on my bookshelf that deserves spotlighting! So, like last week, I’m digging into my childhood to analyze an often overlooked favorite, in comparison to a pop culture phenomenon. In the 1950s, dramatic writer and lyricist Edward Eager, having a difficult time finding books to read to his son, began writing children’s books in the style of E. Nesbit – stories about ordinary children who stumble on some kind of quirky magic (the first book, for example, involved magic that worked by halves – the children had to wish for twice as much of something if they wanted the wish to work completely) that they then use to go on fantastic adventures through space, time, and even literature, referencing everything from One Thousand and One Nights to Little Women. Along the way, the children typically learn to use the magic wisely, and resolve conflicts in their ordinary lives. Eager’s tales of magic spanned seven books in all (the last published two years before his death in 1964), but he did not use the same cast of characters across all seven. 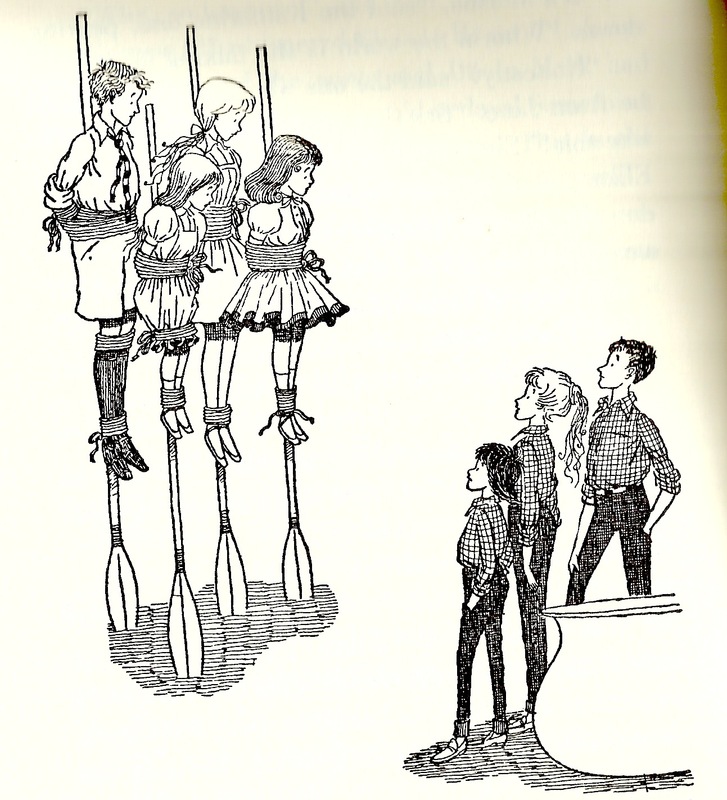 At most, a given cast of children would span two books. However, the siblings of Half Magic (1954) & Magic by the Lake (1957) and the cousins of Knight’s Castle (1956) & The Time Garden (1958), are connected by more than just their writer. Half Magic, the first in the whole series and set in the 1920s, introduces siblings Jane, Mark, Katherine, and Martha. The following book, Knight’s Castle, introduces 1950s siblings Roger and Ann, and their cousins Jack and Eliza – they are the children of Martha and Katherine, respectively. Now, this was probably not the first series to involve the children of previous characters, and it certainly was not the last – Tamora Pierce’s Daughter of the Lioness series and Legend of Korra come to mind. But it is with the following books, Magic by the Lake and The Time Garden that Eager plays with the generation gap in a way that I wish I could see more often. Magic by the Lake returns to the 1920s, with Jane, Mark, Katherine, and Martha spending the summer at a cottage by a lake, discovering that on certain days they can use the lake water to make wishes. Late in the novel, Martha gets her and her siblings in a pickle with cannibals on a deserted island (And I apologize for the author’s sake – it was the 50s, these weren’t the most progressive novels. Not terrible, but not the best), leaving them tied to totem poles awaiting their doom. The older three fall asleep, and awake to see Martha talking to three other children. And she introduces them as Ann, Roger, and Eliza. Basically, imagine Back to the Future if we’d seen the whole thing from George and Lorraine’s perspective. 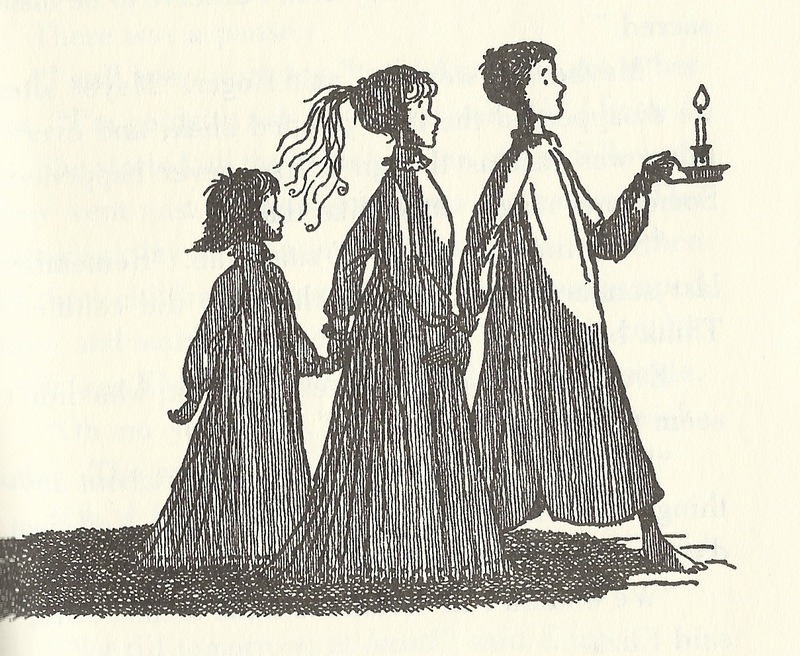 The children proceed to have an adventure together, before Ann, Roger, and Eliza mysteriously disappear, their future mothers none the wiser to who they are… and the audience none the wiser as to how they got there! It’s a pretty good hook for a sequel, huh? You can guess from the title of the following book, The Time Garden, how it happened. The cousins go to stay at a house in the country while their parents go to London for the premiere of a play written by Roger and Ann’s father where they discover the thyme plants in the garden can actually help them travel through time – a literal time garden. 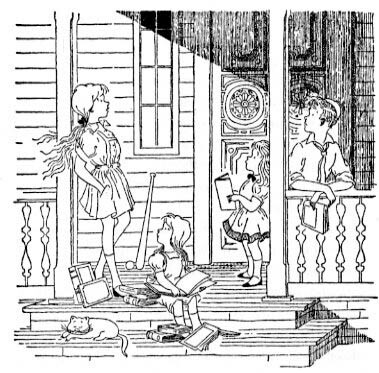 At one point, the children try to use the thyme to see their parents in London. But, not making the wish specific enough, they end up on the island in the past, the whole scene from Magic by the Lake playing out from their children’s perspective. 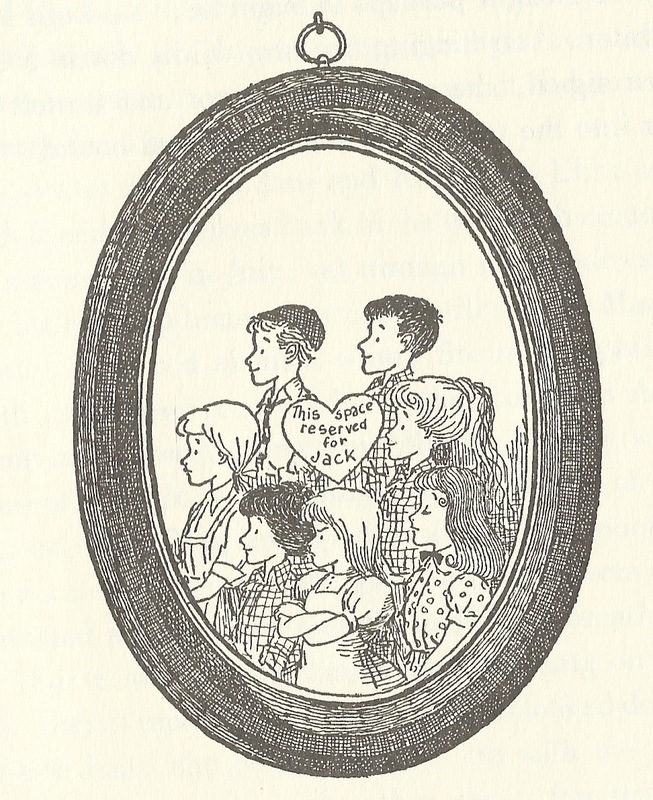 Mark, Martha, Jane, and Katherine meet Ann, Eliza, and Roger in The Time Garden (N.M. Bodecker). Questions posed in the first version of the scene – Did Eliza let Jane fall on purpose? – are answered in the second. Feelings only alluded to in the first become clearer in the second. But at the same time, the children of the future learn something about the past, as their parents never told them of the magic adventures they had as kids. I suppose what I find interesting about these scenes is that we get the same scene from different perspectives across two books, two generations. Normally in time travel stories, especially involving multiple generations in a family, we only see one perspective – either that of the visitor(s) (i.e. Back to the Future), or that of the one(s) being visited (i.e. Meet the Robinsons*). Or if multiple perspectives are involved, we don’t actually see the scene play out again – it’s only alluded to, such as in the Doctor Who episode “Smith and Jones,” when the Doctor proves he’s a time traveler to Martha by going back to before he met her. We see Martha meet him, from her perspective, before the events of the episode. But we don’t see him find her, from his perspective, in the past. With visual media, such things are usually too redundant, so it makes sense not to show them again. Doctor Who does, however, play with revisiting scenes of the past in other episodes, most notably episodes involving Steven Moffat. Moffat enjoys the complications of playing with time travel for more than just history lessons and futuristic speculation, and frequently breaks the previous rule of the Doctor and his companions interfering with their own time stream – “Time can be rewritten” being the catchphrase during his era as head writer. Though such plots often get very overcomplicated very quickly, there are instances, similar to the scenes in Magic by the Lake and The Time Garden, where he pulls it off quite well. This is the episode I use to introduce people to Doctor Who (sorry, “Rose,” I’m just not a huge fan) for a good reason. The episode doesn’t take place from the Doctor’s perspective, so it’s easier to get to know him, and for me it shows the best of what Doctor Who is capable of – giving you chills, laughs, and food for thought all at once. One-off character Sally Sparrow first sees the Doctor as an Easter Egg on a DVD at the local rental shop. The Doctor (and Martha Jones), speaking from 1969, appear to be having half a conversation. The audience thus wonders – what is the other half? And how could the Doctor know? It soon becomes apparent that the message is meant for Sally, and in a thrilling scene the conversation plays out in real time – the prerecorded Doctor speaking from 1969, and Sally speaking from 2007. Thus, we kind of see both perspectives of this conversation – one as an unknowing outsider, in which nothing makes sense, and the other, now in the know, where everything makes sense. And if that doesn’t make your head spin, Sally is the one who gave the Doctor the entire conversation in the first place! Woo. Series 5, I thought, was quite well done, and nothing caps that off better than this finale. Moffat himself has said he is very proud of this script. As the universe collapses in on itself due to the Tardis exploding (long story that I still don’t entirely understand), this episode begins with the Doctor trapped in the Pandorica, River trapped in a time loop in said Tardis, Amy dying, and Rory …well… plastic. And a Roman centurion. Yeah, it’s not good. We then see the Doctor pop in and out to Rory, giving Rory the sonic screwdriver to free him from the Pandorica. The version in the Pandorica has no inkling of this, and has his own sonic screwdriver, making it apparent that there’s some timeline-crossing going on. As the episode unfolds, we see the circumstances that lead to the Doctor going back in time to fix this, as well as many other, happenstances in the episode. Again, questions posed later get answered by seeing another perspective! But the craziest, most unexpected perspective shift happens when the Doctor is being erased from existence. Amy, who grew up near one of the cracks, is able to retain the memory of things erased by these cracks, and can thus hear the Doctor even as he is fading away. A scene from an earlier episode in the season, “Flesh and Stone,” plays out. What looked then like the Doctor coming back to comfort Amy was in fact the future version of the Doctor as he is fading away, begging her to remember. Though some people noticed the future Doctor wearing his jacket while the Doctor from that episode had it off, most had written it off as a costume error. The whole scene is suddenly entirely different in this light – even the music is different, in fact! I just thought the way this particular season resolved was clever in terms of playing with perspectives in time travel. Ah, River Song. What can we say about River Song? It’s hard to judge how well her story, in relation to the main timeline, works out. Some would say it is sloppily handled, and I can’t blame them. There are a lot of holes and speculations that will probably never be fully understood (plus, her whole life hinging on the Doctor is more than a bit problematic). She, like Roger, Ann, and Eliza, is the child of previously appearing characters who has to hide that she is related to them… with a whole mess of other complications. This supplemental video, however, does shed some light on River’s perspective of the events of Series 4-6, and helps us understand just how much she had to hide and lie from people she cared about just so things turned out all right. But I do wish we’d seen more of this in the main show! Or a supplemental book! I don’t know. It might have made things less confusing. 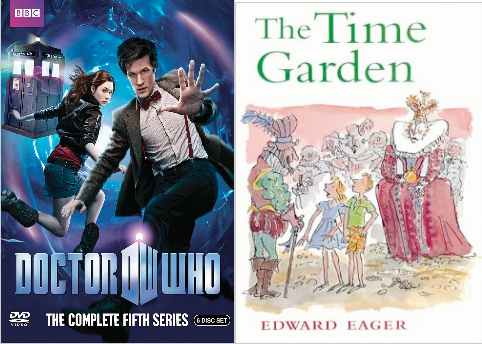 it would be cool if children’s writers could tap into this audience and create some more stories playing with perspectives and family timelines, as The Time Garden did back in the day (If anyone out there knows of any, let me know in the comments). And Doctor Who could learn from Edward Eager in terms of keeping the time travel easy to follow, as many have gotten frustrated with the increasing complexity of the Doctor’s timeline since Series 5. Or keeping such things contained to single episodes, as both of Eager’s novels kept the magical overlap contained to a single chapter, with no or little impact on the futures of Jane, Mark, Katherine, and Martha. Just my two cents. Tune in next Tuesday for a new post! Learn more about the blog here, about me here, and resources here. Check out the links for related works and Pinterest boards in the sidebar.